The Auto Reverse Module is a circuit designed to operate on model railroads running DCC. When a track is looped back to it self, the outer rail on the north side of the track will return and make contact with the south rail. This creates a short circuit. To resolve this, the rails on both ends of the loop need to be isolated so the short does not occur. In order for a locomotive to run smoothly into the reverse loop, the polarity of the loop needs to be switched so the loop polarity matches the track where the locomotive enters the loop. It then needs to be switched again as the locomotive exits the loop. The Auto Reverse Module was designed to take care of that function automatically. The ARM-1 circuit detects when the locomotive enters the loop and switches the output polarity if is sees a short. This is done very quickly with a mechanical relay so there is no disruption to the operation of the train. * Terminal strips for easy connections. * Does not require any external components to operate. Connections to the ARM-1 board are simple and easy to understand. DCC in connects to the DCC bus and DCC out connects to the reversing loop, wye junction or turntable rails. 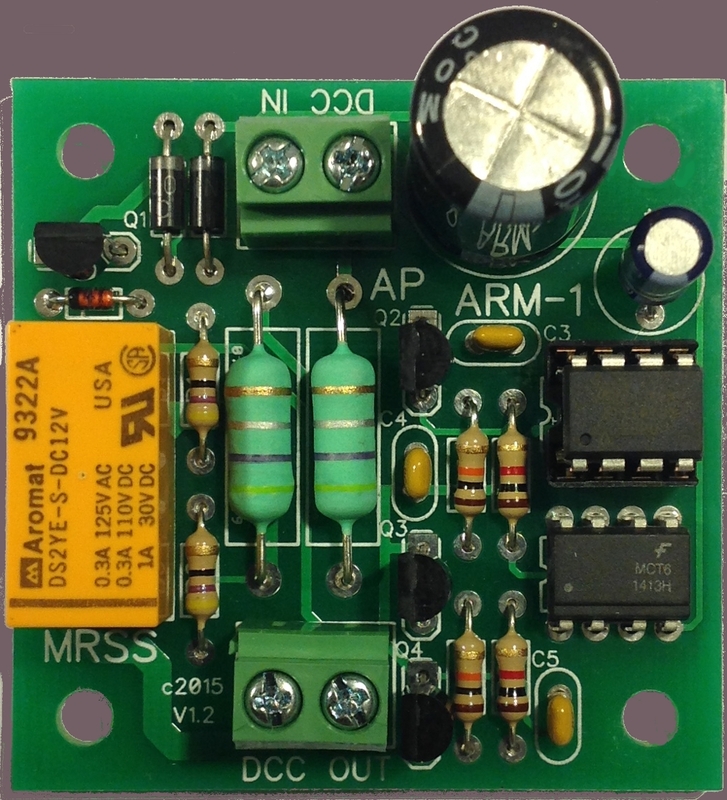 This ARM-1 board requires no external power source. DCC IN - DCC into the board. DCC OUT - DCC out to the loop, wye junction or turntable.